These silver tokens are a constant reminder of the loyalty and deep sense of duty of our forebearers and an incentive to all of us to try and do better. Field Marshal Sir Gerald Templer. This part of the Website is an attempt to record the silver which was part of our regiment’s history. All of our former regular, militia and territorial regiments/battalions had wonderful displays of silver. Regimental silver is, of course, family silver and records a part of the history of that particular regiment or battalion. Each piece has a story to tell, whether it be a simple tankard or goblet to the wonderful and lovely intricate workmanship of the silver centrepieces. The engraving of the silver also records past events, from a Polo Championship to the winning of the Army Football Cup, and the engraving of the goblets which were presented by individual officers to their mess, from Aldershot to Tienstin. Silver drums and bugles were presented by battalions, towns and individuals in memory of men who gave their lives serving their Sovereign, Country and Regiment. Many pieces of silver were presented to record an individual act of gallantry or an action in which elements of the regiment took part. The silver also records the uniqueness of individual regiments, which makes the British Army so different and better than other armies. Each regiment has its own traditions, dress variations, customs, cap-badges and Battle Honours, all jealously guarded. Our Regiment has been involved in many changes from its first muster to the Cardwell and Haldane Reforms, through two World Wars, the loss of the Second Battalions and Territorial Units after the Second World War - the amalgamation of the 1950s and 1960s to Options for Change in 1992, and the loss of many Territorial units in 1997 as a result of the Strategic Defence Review. 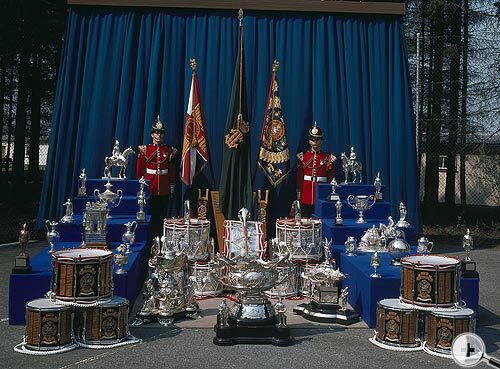 Over the years the regiment has had to dispose of a considerable amount of its treasures but a large amount of our old regimental silver, regular and territorial, is now a part of The Princess of Wales’s Royal Regiment collection and many of the traditions handed down over the years are now part of their heritage and in use today. Sadly during the 19th century, both the 31st and the 70th Regiments were singularly unlucky in losing the greater part of their officers’ mess silver, the one by shipwreck and the other by flood. On 1st March 1825, the sea claimed the silver of the officers of the 31st (Huntingdonshire) Regiment of Foot while it was on passage from England to India. Their ship, the East Indiaman Kent, was crossing the Bay of Biscay when she caught fire. The flames took a rapid hold and the order was given to take to the boats. There were not nearly enough of these to accommodate the passengers and crew but, fortunately, another vessel saw the fire and came to their aid. At midnight the ship blew up. The 31st lost all its regimental property. There are three pieces of silver having a direct connection with the sinking. One is a snuff box presented by an officer who had served with the regiment from 1800 to 1808, a Colonel Meade. This was brought away from the ship before she sank. The second is a replica of Colonel Meade’s box, presented to the officers’ mess by a Lieutenant Holford of the North Durham Militia “as a token of their kindness and hospitality during his stay amongst them”. The third, known as the Kent Snuff Box, carries the engraved wording “Presented to Mr Edward Connolly, First Mate of the Brig Cambria, by the Officers of The 31st Regt and the Officers and Passengers of the Kent East Indiaman, for his valuable assistance in rescuing the 554 persons from the wreck of that vessel during her conflagration on the 1st March 1825”. All three snuff boxes are today displayed in the Regimental Museum at Clandon. In 1881, the 31st Regiment was amalgamated with the 70th (Surrey) Regiment of Foot. They became, respectively, the 1st and 2nd Battalions of The East Surrey Regiment. By a strange coincidence, the 70th also had lost the greater part of its silver in earlier years. In 1858, the regiment was stationed at Nowshera, on the banks of the River Cabul. A subaltern serving there at the time wrote this account: “Early in August there had been a landslide far up the Indus in the hills and a large body of water formed in a sort of dam. Suddenly heavy rain set in and the whole mass of water reached down to Attock, at the confluence of the Indus and Cabul rivers and where the channel is very narrow. Consequently the water rushed up the Cabul river, actually making it flow backwards”. Major A E Jones, who was the Mess Sergeant at that time, later recalled that he was woken by one of the native servants. He recalled a great mass of water was coming up the Cabul river against the normal direction of flow. Sergeant Jones sent for the President of the Mess Committee and, surrounded by steadily rising water, they hurriedly started to pack up the Mess property. “The water rose in the Barracks about six feet, but where the Mess was. it covered the bungalow”. After the flood subsided, two soup tureens, one sugar bowl and two bread baskets were recovered from the wrecked buildings. The tureens were gifts of the people of the islands of Antigua and St Thomas in 1806 and 1811, (the 70th having been stationed in the West Indies in those years). They too are now on display at Clandon. Other objects - silver, glass and crockery - were recovered from the sea of mud and debris, but much had been lost or damaged. Display of silver, 1st Bn The Queen's Regiment, Anglo-German week, Werl, 1977. Several days later a villager walked into the Nowshera barracks carrying a silver mess hot water dish. He had found it on the banks of the river at Attock, twenty miles down-stream from Nowshera. Then, seventy-two years later, in 1928, a silver tray was recovered. It was found in Rawalpindi, presumably being offered for sale in a bazaar, by an officer of the 1st Battalion The East Surrey Regiment who immediately recognised its 70th Regiment engraved crest. 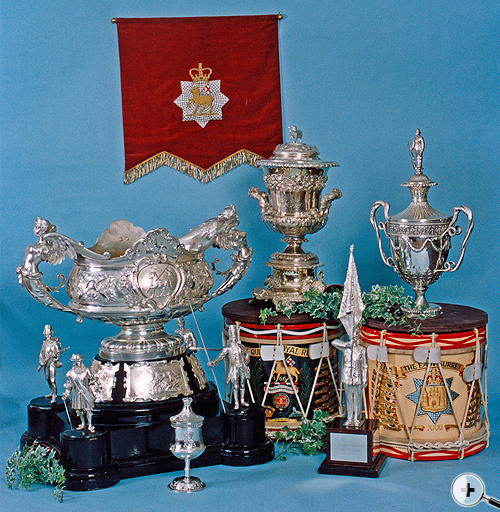 As viewers will see from the photos of mess silver, the regiment has always taken a pride in the display of its collection. This continued when the Queen’s Regiment held their Grand Reunions, normally, the side of the gymnasium being transformed by silver from all its forebear regiments. When the 1st Battalion was stationed in Werl (then West Germany) a display was mounted in the Commerz Bank, in aid of an Anglo-German week, to raise money for children’s charities. Many favourable comments from German newspapers and letters to the Commanding Officer followed the exhibition. “The Officers of the 1st Battalion The Queen’s Royal Regiment, gave a Ball in the Country Club last night. There was a large number present and the arrangements were enjoyed by all, and the event acclaimed a social success. Colonel J D Boyd, DSO and Mrs Boyd received the guests as they arrived shortly after ten o’clock and gave them a warm welcome. An excellent programme of music was provided by the orchestra and the military dress uniforms of the Officers of both British and other nationalities, lent much gaiety to the event added to which several good looking Scots had donned their national costume. Flowers formed the principal decoration and were effective in their simplicity, much taste being displayed in their artistic setting. The names of a few of the places where The Queen’s have won fame and glory were dotted around the main dancing hall, and in an inconspicuous size. This modest reminder of the Regiment’s fine history made a happy association for the evening. Refreshments during dancing were served at a table arranged on the south side of the ballroom, and shortly after midnight an excellent supper was given in the dining room just off the ballroom, when a first class menu was served. A feature of interest to all the guests was the English Silver which had been brought from the Officers’ Mess for the decorations of the tables etc: this proved a revelation in its beauty of design and in many cases, massiveness. We understand this Silver is valued at several thousands of pounds sterling, a pair of solid silver candlesticks were among the collection and stand four feet high, whilst another gem is a massive silver soup tureen dated 1801 and running well into four figures sterling in value. There are many other old pieces of equal beauty and now forming antiques. A horn, beautifully carved with a map of Canada by one of The Queen’s men in the early part of the 18th century, and presented to his regiment, is among the collection and has since been mounted in silver. This priceless collection was very daintily displayed here and there, and the opportunity of a glimpse at it was appreciated. The Officers of the Queen’s proved genial and hospitable hosts last night and each went out of his way to cater to the comforts and wants of the guests and to make all happy. They showed a fine spirit throughout the evening which made it all the more difficult for the guests to thank them for a night which will long be remembered”. 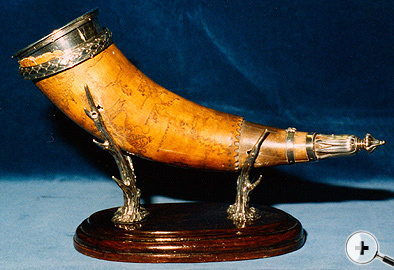 The horn was carved and carried by a soldier of the 2nd Queen's Dowager's Regiment. It had a map of North America, 1707 etched into the horn. It had a silver embellishments added to the horn after it was purchased from the private soldier by an Ensign Holdsworth, who presented it to the offices' Mess in 1837.